3 cans (4 oz each) of Maine sardines. ¼ cup of malt vinegar. 2 tablespoons of dry white wine. ½ teaspoon of prepared horseradish. ½ cup of onion, thinly sliced. 1 cup of cucumber, peeled, thinly sliced. 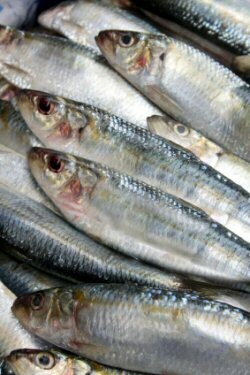 Drain the sardines and arrange in a single layer in a shallow baking dish. Combine the sour cream, half-and-half, malt vinegar, lemon juice, white wine, crushed garlic, horseradish, and salt. Separate the onion slices into rings, then add the onion and cucumber. Mix thoroughly, then spread over the sardines. Chill for at least 8 hours or overnight. Arrange in lettuce cups and sprinkle with paprika.